We went down to the new place in Sunnyvale to measure the rooms this afternoon.Â This house is HUGE! !Â According to the official records, it’s just over 1000 square feet…plus a garage…plus a front and back yard…with a shed in the yard.Â Inside, there’s a big living room, a biggish kitchen, a dining room, two large bedrooms and one smaller bedroom.Â What luxury! !Â Mike and I are currently sharing a not-overly-large 1-bedroom apartment, and we’re dreadfully cramped for space.Â My loom and my “office” (computer + monitor) are living on the dining room table, which is also where I do all my sewing.Â So the prospect of THREE bedrooms, plus a living room, plus a separate dining room/kitchen, is a bit overwhelming. This way I can have natural light over my shoulder as I’m threading or weaving.Â The alcove will be the perfect place to put weaving tools, and the computer desk will give me a place for the laptop that drives my loom.Â (It will also serve double duty as my “home office”. )Â The table in the bottom right corner will be my sewing table, the bookshelf will hold my craft/weaving books, and the ironing board will be conveniently situated (folded up when not in use). I’m satisfied with this plan and will give it a try once we get everything in.Â The only thing we’ll need to buy is a small computer desk. Back to packing!Â We got a lot accomplished yesterday and today, so I’m not feeling too bad about sneaking some time to blog. Good luck packing and moving. As for the coat I think the problem is that with us being so short at the torso it is difficult not to get the wrinkles caused by the seams. would look a lot better. After all it is a coat not a fitted dress. The above style would require a lot less seams, easier to construct and with it not being fitted a lot less chance for puckering seams. Woman after my own heart! 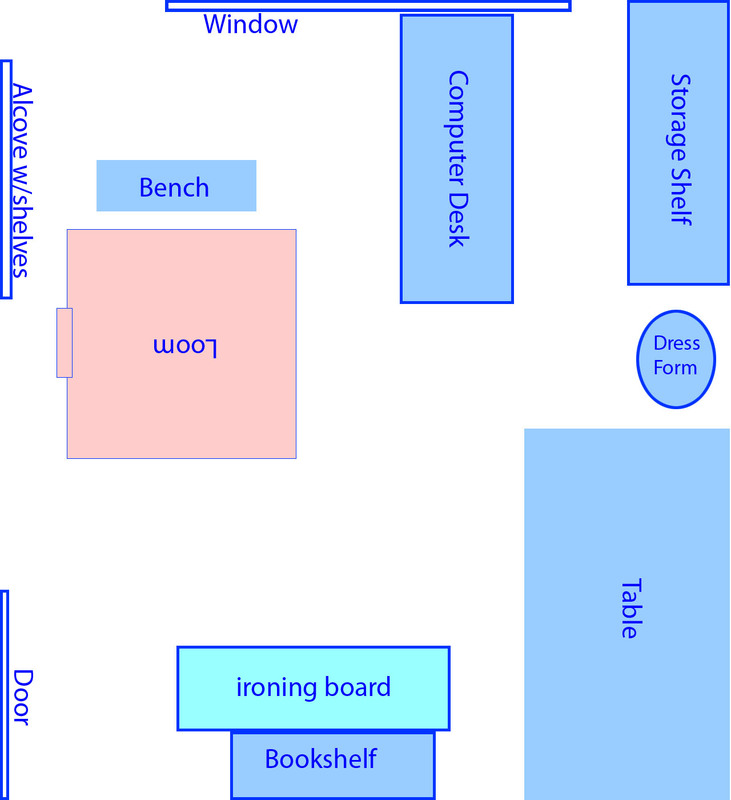 Room planning is the only reason I bother keeping Visio around these days. Looks like a good room for working. Something to look at with that window — classical studios for weaving, woodworking, and other worthwhile pursuits had a north-facing window. I once set up my studio in an east-facing window, and found at certian times of the morning, it was unworkable. Too much bright light made it hard to see details, particularly as my body cast a shadow on the work. As you can’t move the house, you may want to consider a translucent shade of the window if this is the case.